Witch Balls were very popular in 18th century England, but their actual origin is thought to be much older. 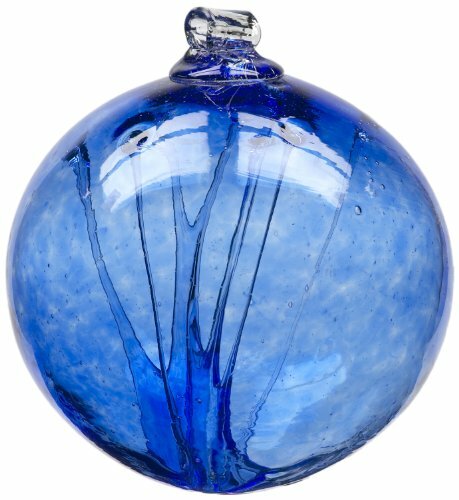 For well over 300 years hollow glass spheres have been hung in windows to ward off witch spells, evil spirits and ill fortune. Hanging these decorative balls in the window is thought to tantalize evil spirits which may be threatening a home's tranquility. The evil spirit is mesmerized by the ball's reflective beauty. When the spirit touches the sphere it is absorbed and trapped in the web-like strands of glass inside the ball. Manufacturer: Kitras Art Glass Inc. Publisher: Kitras Art Glass Inc. Studio: Kitras Art Glass Inc. If you have any questions about this product by Kitras Art Glass, contact us by completing and submitting the form below. If you are looking for a specif part number, please include it with your message. © 2019 - chippyandloopus.com. All Rights Reserved.